The cast and crew of The West Wing TV show reunited a little more than 10 years after the TV series finale, this weekend, in Austin, TX. The reunion took place at the ATX Television Festival panel celebrating NBC‘s acclaimed political drama. Creator and Executive Producer Aaron Sorkin and Director/EP Thomas Schlamme — who left the series after its fourth season — appeared, as did cast members Bradley Whitford, Dulé Hill, Janel Moloney, Joshua Malina, Richard Schiff, and Melissa Fitzgerald. MSNBC‘s Lawrence O’Donnell, who wrote 16 episodes of The West Wing, moderated the panel, at the Paramount Theatre, pictured below, on the right. Sorkin said The West Wing almost never made it to air. As soon as he finished scripting the pilot, news of the Monica Lewinsky scandal broke. After it was shot, NBC screened the pilot for test audiences. Their response left the network “on the fence” about picking it up. The panelists paid tribute to the late John Spencer, who died in 2005 at the age of 58. Spencer played Leo McGarry, White House Chief of Staff, and later Senior Counselor to the President. Spencer passed away after filming five episodes of The West Wing‘s seventh and final season. Leo’s death was written into the story, in response to the actor’s death. Here is a picture of The West Wing TV series reunion, from the ATX Festival Instagram account. What do you think? Are you a fan of The West Wing TV series? 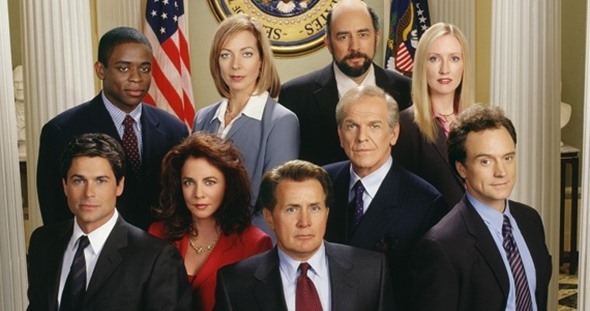 Would you watch a West Wing sequel movie? A West Wing sequel would be great! We miss all the characters and felt like they were part of our family. Any good writer could put this together with such an enthusiastic cast. They would probably use the original cast to make guest appearances, and use younger people as the new main characters. That’s television. I would love to see a sequel movie, IF it were written by Aaron Sorkin!